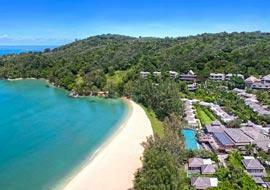 There are many reasons why Phuket is the number one choice as a family holiday destination in Thailand. While you will find creature comforts and stimulating things to do for children in all tourist areas of the country, few if any can compete to what this island dishes up. Your first priority will be where to stay, and for this we offer a list of the best Phuket family hotels from which it is unlikely you won't find exactly what you are looking for, from affordable, but reliable places to opulent luxury accommodation. The island is of course more than just kid friendly resorts with family rooms equipped for comfort, because outside a wealth of entertainment awaits. 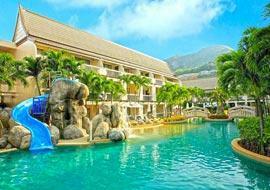 There are the Phuket Fantasea shows, the mind boggling 3D Trickeye Museum, surfing artificial waves at the Surf House, The Splash Jungle Water Park and The Kids Club play centre in Patong freeing up time for a round of golf. 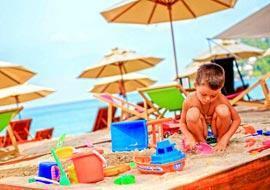 Following such adventure our list of the best hotels to stay with kids will see you unwind with tailor-made facilities. Located in an intimate cove this luxurious boutique resort features a child care and entertainment centre and offers 2 bedroom villas to 5 bedroom residences framing ocean views. All have private gardens featuring your own pool where it is easy to keep an eye on the children. Flanked by lagoons facing the sea in Bangtao Beach Angsana Laguna occupies its own island offering facilities which are hard to beat like shuttle boats to boutique shops and restaurants, 2 bedroom suites with rooftop patios overlooking lagoons, golf course and kids club. 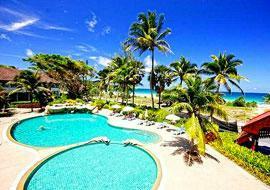 Few resorts in Karon are directly on the beach, but this is one of them. 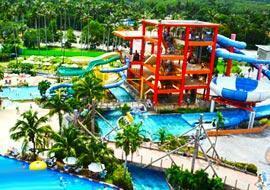 It is near entertainment in Karon Village and features a beachfront water park with slides and pools, spacious accommodation and Centara's Camp Safari and E-Zone entertainment for young guests. 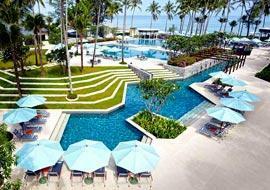 Located on secluded Mai Khao Beach the facilities leave no time for boredom. Central among these is the Splash Jungle Water Park with free entry for hotel guests, luxury 2 bedroom suites with a kitchen, dining room and lounge, and 3 bedroom pool penthouses. 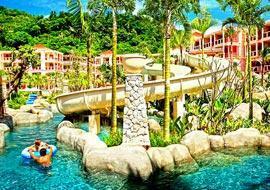 Featuring a pool with a slide which you can watch from the swim up bar, 2 more pools with their own bars and submerged Jacuzzi beds, plus a playground with day care, this resort in Kata Beach offers affordable luxury accommodation sleeping up to 7 persons. Located in up-scale Surin Beach 20 minutes from Patong one child below 12 stay free when sharing your bed and one below 3 stay free in a crib. It offers thoughtful extras like baby high chairs, a child care centre with activities menu, videos and baby sitting service. 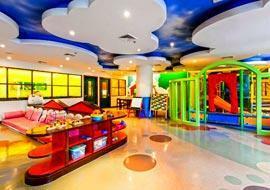 One may not expect to find the best family friendly hotels in Patong Beach given its nightlife scene, but with a new child entertainment centre this is one of a few that may exceed expectations. Rooms with separate sleeping areas for the children are equipped with toys. Dusit Thani is a luxury beachfront resort with access to an incredible range of facilities which will appeal to parents, teenagers and small children. It starts with a world class golf course, an outdoor adventure centre, horse riding, tennis, 8 spa treatment rooms and child care. 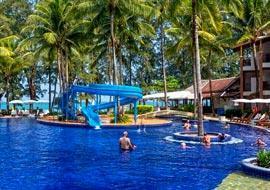 Between Centara, Angsana Laguna and Movenpick Resort in Karon Beach one undoubtedly finds the best kids clubs in Phuket. Besides this blessing for parents Movenpick feature a 2 bedroom suite and residence with an equipped kitchen and large terraces with ocean views. 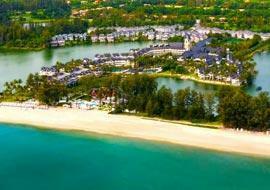 Directly on the beach in Bangtao Outrigger offers accommodation on the fringes of lagoons. Besides entertainment programs and dedicated pool for children, tennis courts and dive centre it offers a 2 bedroom villa with club access sleeping up to 6 people. If you prefer to stay near a cosmopolitan scene with a beachfront location this in demand resort in Patong Beach is ideal. It offers family accommodation sleeping 4 persons which allow access to one of 2 pools directly from your private outdoor terrace. Combining affordability with facilities such as a licensed clinic, 2 kids pools, supervised play areas and even a mini disco, plus ground floor rooms with enclosed gardens featuring high chairs and baby strollers Sunwing is a good hotel for families with small children. 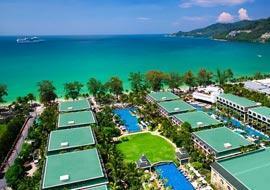 Located in Kamala Beach the resort's popularity suggest booking early to avoid disappointment. 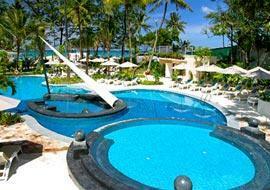 It features 7 pools with palm tree dotted islets and a water slide. 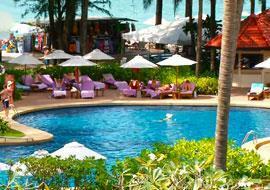 Like its sister in Bangtao it offers a kids club and spacious suites with kitchens sleeping 6 persons. 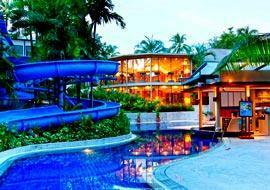 From the children's amusement zone featuring stimulating activities and professional supervision to the pool slide and colourful decor of their own separate room in 2 and 3 bedroom suites with a kitchenette this resort in Kamala beach makes a holiday for young guests special. With paved walk ways meandering through gardens of blossoming flowers, Lily Ponds and waterfalls Thavorn is a seaside resort in Karon with a kids club. 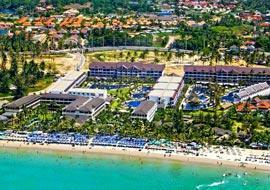 It features all the facilities you expect of a 1st class family oriented destination and rooms equipped with baby cots.